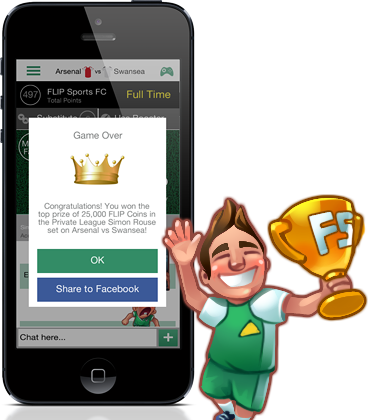 Whether you're an avid fantasy league fan or new to the game, FLIP Sports offers a great way to engage with your mates and your favourite teams. 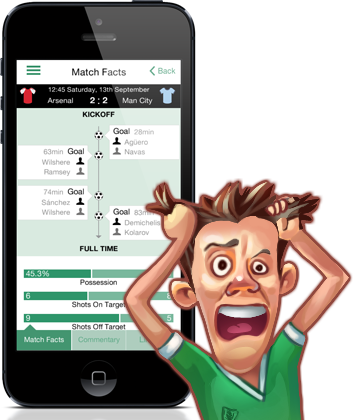 Watch your fantasy team earn or lose points in real-time and experience the thrill and despair of real life football management as events unfold live on the pitch. 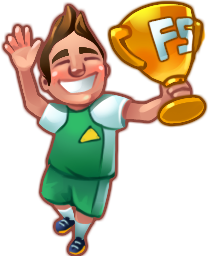 Challenge friends and foes to any match, use in-play strategy features to overcome your opponent and keep the banter flowing throughout with in-game messaging. 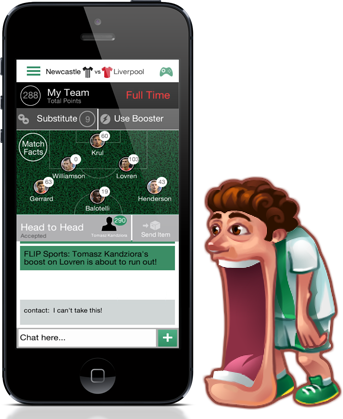 Whether you’re an avid fantasy league fan or new to the game, FLIP Sports offers a great way to engage with your mates and your favourite teams. An engaging & compelling second screen experience. Watch a match and play the game in real time. Play who you want, when you want with no long term commitment like traditional fantasy league games. 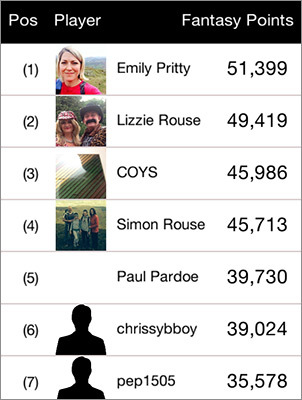 Compete head to head or in leagues, with leaderboards to see how you compare against others. 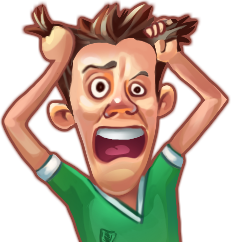 Chat & banter with your opponents while playing the game. In-depth stats and data on players, teams and matches throughout the season. The app is easy, smooth, and fluid to use and will have you coming back again and again. For anyone interested in picking up fantasy football, this is a perfect start. But for fans of the beautiful game, this is a must have. FLIP Sports is definitely worth trying out if you’re a soccer fan who wants to flex your managerial muscles and take the game to a whole new level. 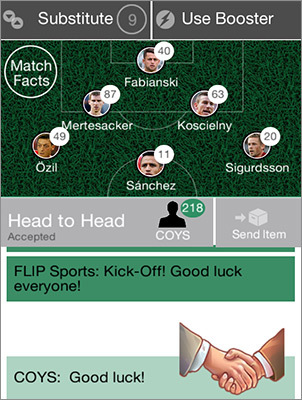 Flip Sports lets you play fantasy sports on your mobile device while you watch TV. If FLIP Sports aimed to make fantasy football easier, then it certainly succeeded. The sooner you pick this one up the better. Best fantasy football game around. 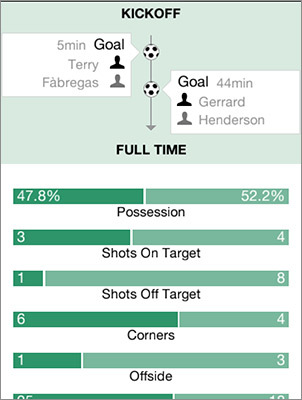 Makes even a boring nil nil exciting! Great game. The more you play the better it gets. A must have for all football fans and budding tacticians! Easy to use, great way to challenge your mates. You agree that you shall take all steps necessary to protect your Login Information and keep them secret. You agree that you shall not give your Login Information to anyone else or allow anyone else to use your Login Information or Account. If you fail to keep your Login Information secret, or if you share your Login Information or Account with someone else (whether intentionally or unintentionally), you accept full responsibility for the consequences of this (including any unauthorised purchases) and agree to fully compensate us for any losses or harm that may result. We will not be responsible to you for any loss that you suffer as a result of an unauthorised person accessing your Account and we accept no responsibility for any losses or harm resulting from its unauthorised use, whether fraudulently or otherwise. In the event you become aware of or reasonably suspect any breach of security, including, without limitation any loss, theft, or unauthorized disclosure of your Login Information or unauthorized access to your Account, you must immediately notify us. We reserve the right to delete your Account if no activity is conducted by you in relation to the Account for 180 days or more. In such event, you will no longer be able to access and/or use any Coins (as defined below) associated with that Account and no refund will be offered to you in relation to the same. violate the contractual, personal, intellectual property or other rights of any party, promote or constitute illegal activity; or violate these Terms. (iii) your violation of any third party right, including without limitation any copyright, property, or privacy right; (iv) any claim that a Posting made by you has caused damage to a third party; or (v) any Posting you post or share on or through the App. 11. INTELLECTUAL PROPERTY RIGHTS By using the App you are hereby acknowledging all rights, titles and interests in and to the App, including, but not limited to, applications, software, designs, graphics, texts, information, pictures, video, sound, music, and other files, and their selection and arrangement, belong or are licensed to us and that you will not acquire any right, title or interests in or to the App except as expressly set forth in this Agreement. 12. DISCLAIMERS YOUR USE OF APP IS AT YOUR SOLE RISK. THE APP IS PROVIDED ON AN "AS IS" AND "AS AVAILABLE" BASIS. WE RESERVE THE RIGHT TO RESTRICT OR TERMINATE YOUR ACCESS TO THE APP OR ANY FEATURE OR PART THEREOF AT ANY TIME. WE EXPRESSLY DISCLAIM ALL WARRANTIES OF ANY KIND, WHETHER EXPRESS OR IMPLIED, INCLUDING BUT NOT LIMITED TO: THE IMPLIED WARRANTIES OF MERCHANTABILITY AND FITNESS FOR A PARTICULAR PURPOSE AND ANY WARRANTIES THAT MATERIALS IN OR MADE AVAILABLE THROUGH THE APP ARE NONINFRINGING, AS WELL AS WARRANTIES IMPLIED FROM A COURSE OF PERFORMANCE OR COURSE OF DEALING; THAT ACCESS TO THE APP WILL BE UNINTERRUPTED OR ERROR-FREE; THAT THE APP WILL BE SECURE; THAT THE APP WILL BE VIRUS-FREE; OR THAT INFORMATION IN OR MADE AVAILABLE THROUGH THE APP WILL BE COMPLETE, ACCURATE OR TIMELY. NO ADVICE OR INFORMATION, WHETHER ORAL OR WRITTEN, OBTAINED BY YOU FROM US OR IN OR MADE AVAILABLE THROUGH THE APP SHALL CREATE ANY WARRANTY OF ANY KIND. WE DO NOT MAKE ANY WARRANTIES OR REPRESENTATIONS REGARDING THE USE OF THE MATERIALS IN OR MADE AVAILABLE THROUGH THE APP IN TERMS OF THEIR COMPLETENESS, CORRECTNESS, ACCURACY, ADEQUACY, USEFULNESS, TIMELINESS, RELIABILITY OR OTHERWISE. YOU UNDERSTAND AND AGREE THAT WE AND OUR AFFILIATES, SUBSIDIARIES, OFFICERS, DIRECTORS, EMPLOYEES, AGENTS, CONTRACTORS, PARTNERS AND ADVERTISERS SHALL NOT BE LIABLE FOR ANY PUNITIVE, COMPENSATORY, INCIDENTAL OR CONSEQUENTIAL DAMAGES THAT RESULT FROM (A) THE USE OR INABILITY TO USE THE MATERIALS IN OR MADE AVAILABLE THROUGH THE APP; (B) UNAUTHORISED AND OR ILLEGAL ACCESS TO DATA; AND (C) ILLEGAL REPRODUCTION OF COPYRIGHTED MATERIALS. 13. BREACH OF TERMS AND TERMINATION If you breach any of your obligations under these Terms, we reserve the right to immediately suspend or terminate your Account. In such circumstances, you will lose any Coins that you may have and we will not compensate you for this loss or make any refund to you. 14. 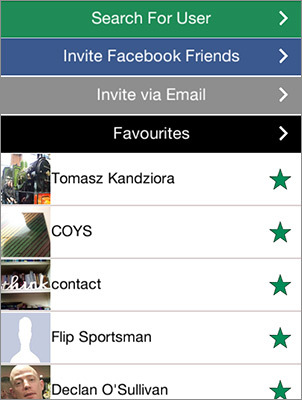 DISPUTE HANDLING Should you have any dispute or cause of complaint in relation to the App, you must submit your complaint by contacting info@flipsports.com If you are a User in the United States, the following shall apply if any dispute between you and us cannot be resolved: (a) ARBITRATION. YOU UNDERSTAND AND AGREE THAT ALL CLAIMS, DISAGREEMENTS, DISPUTES OR CONTROVERSIES BETWEEN YOU AND US AND/OR RELATED COMPANIES ARISING OUT OF OR RELATING TO THE APP, THE USE OR ACCESS THEREOF, OR THESE TERMS SHALL BE RESOLVED BY FINAL AND BINDING ARBITRATION, WHICH MUST BE COMMENCED WITHIN ONE (1) YEAR AFTER SUCH CLAIM OR CAUSE OF ACTION ARISES. BECAUSE THE APP PROVIDED BY US CONCERNS INTERSTATE COMMERCE, THE U.S. FEDERAL ARBITRATION ACT ("FAA") GOVERNS THE ARBITRABILITY OF ALL DISPUTES. THE ARBITRATION SHALL TAKE PLACE IN LOS ANGELES, CALIFORNIA. USA. THE ARBITRATION SHALL BE ADMINISTERED BY THE AMERICAN ARBITRATION ASSOCIATION (“AAA”) IN ACCORDANCE WITH TITLE 9 OF THE US CODE (UNITED STATES ARBITRATION ACT) UNDER THE AAA’S COMMERCIAL DISPUTE RESOLUTION PROCEDURES AS SUPPLEMENTED BY THE SUPPLEMENTARY PROCEDURES FOR CONSUMER-RELATED DISPUTES (AND AS STATED THEREIN, IF THERE IS A DIFFERENCE BETWEEN THE COMMERCIAL DISPUTE RESOLUTION PROCEDURES AND THE SUPPLEMENTARY PROCEDURES, THE SUPPLEMENTARY PROCEDURES WILL BE USED). YOU AND WE VOLUNTARILY AND KNOWINGLY WAIVE ANY RIGHT YOU OR WE HAVE TO A JURY TRIAL. (b) NO CLASS ACTIONS. NEITHER YOU NOR WE SHALL BE ENTITLED TO JOIN OR CONSOLIDATE CLAIMS IN ARBITRATION BY OR AGAINST OTHER USERS/CONSUMERS OR ARBITRATE ANY CLAIM AS A REPRESENTATIVE OR MEMBER OF A CLASS OR IN A PRIVATE ATTORNEY GENERAL CAPACITY. 15. JURISDICTION AND APPLICABLE LAW These Terms are governed by the laws of England and Wales. Any dispute arising out of or relating to these Terms shall be subject to the exclusive jurisdiction of the courts of England and Wales. Personal Information provided when you register an Account and all content, materials and information submitted to or uploaded in or through the App. details of your use of the App and the resources that you access (for example, information about how and when you play a Game or what device you use to access the App). Information that you provide if you report a problem with the App. Correspondence passing between you and us including, but not limited to, any interactions with us on our social media channels. to recognise you and your device, for example by identifying your IP address. to store your passwords and information about your preferences so as to allow us to customise the App according to your individual interests. to allow our App to interact with a third party social network or platform (where you have chosen to allow such interaction). Ensuring that content in or through the App is presented in the most effective manner for you and for your device. Providing you with customer support. Statistical analysis and market research. Advertising and marketing activities. For example we may notify you of special offers and updated information regarding our various products and services and other products and services offered by carefully selected third parties if we feel they may be of interest to you. to any third party that purchases our company or our business or any part of it.